Photograph courtesy Isao Echizen of Tokyo’s National Institute of Informatics. In recent years facial recognition has been integrated into security cameras and databases and Facebook, even used to covertly monitor consumers and track shopping habits. 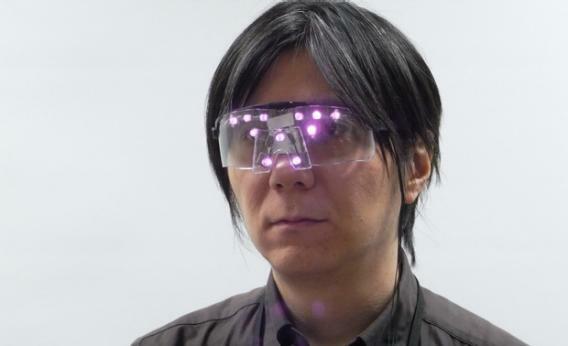 The glasses, currently in prototype form, are hardly what you would term stylish. They are essentially a pair of clunky-looking lab goggles. Attached to them are small circular lights that, when turned on, are visible only to cameras. They are connected to a wire and a battery that you have to carry in your pocket. But though the design might require a few tweaks, the concept has been attracting significant attention in Japan, where it has been featured on TV. Facial recognition technology has historically lacked accuracy, with cameras struggling to detect people if light sources were poor or faces tilted at an angle. However, the software algorithms used in the recognition process are constantly improving, and face recognition tools are being embraced by law enforcement across the world—from the United States to Ecuador. Face detection methods have also been increasingly used as part of social networking. It was integrated into Facebook, causing a privacy backlash in Europe that eventually forced the popular website to remove the function. Perhaps in a sign of how the technology is evolving, Echizen found that face recognition software used by Google’s Picasa image management platform could not be thwarted by wearing five different types of sunglasses (one at a time) or by tilting his head at various angles. It was then that he began experimenting using infrared light sources to create “noise” across key areas of the face used in the recognition process (particularly the eyes and nose). Others have been tinkering with similar innovations. Last week, I reported on New York-based artist Adam Harvey’s “anti-surveillance” range of clothing, including a “drone-proof” hoodie and a cell phone pouch designed to thwart tracking. Echizen and Gohshi were partly inspired by one of Harvey’s previous projects—CVDazzle, which explored how face painting and hair styling could be used to counter face recognition. Of course, it remains to be seen whether these anti-surveillance accessories will be embraced outside what Harvey aptly termed the “fashionably paranoid market.” But the burgeoning trend of innovation in this area shows there is a real thirst for privacy in a world where surveillance technologies are becoming increasingly advanced and ubiquitous.